Last night, my housemates and I ventured to our friends' flat in Hove for an evening of Annie Hall and pizza. I'd seen the film before, granted many years ago, but for lots of our little clan, nestled comfortably between Dominos boxes and hot water bottles, it was their first glimpse of the awkward queen of androgynous chic. It's crazy to think despite the film being released over 30 years ago how much the style still resonates today. For me, my favourite parts were the shots of New York City, from Coney Island to the skyline at dusk. Watching Annie career frantically down the city streets in her clanking VW Beetle, with Alvy acting the frightened passenger, made me place my hands to my face in apprehension as well as to shield my immense grin. 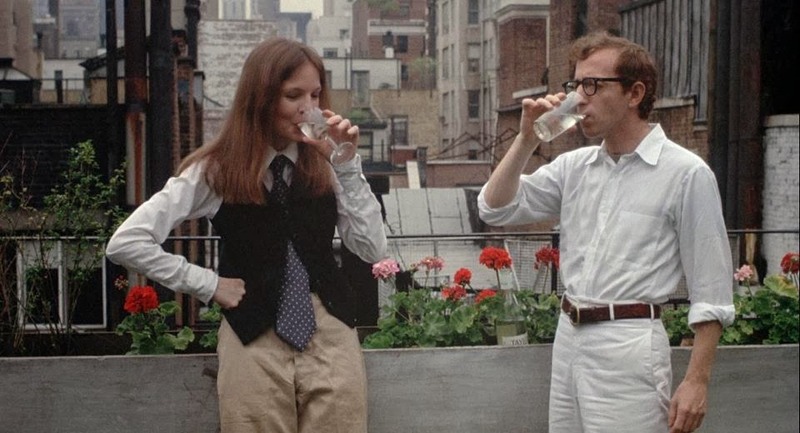 Diane Keaton's Annie is frightfully cool, in her own self-conscious, head-in-the-clouds kinda way. Woody Allen, not so much. The sight of his pale chicken legs made us collectively question the believability of the romantic pairing. I've been thinking a lot about New York recently. Last year while studying abroad in Massachusetts it was only a $20 bus ride away (a bus which admittedly did take 4 hours, but hey that's like travelling to Manchester) so I was lucky enough to go a number of times. An old friend from Texas has taken up residence in Queens and on my first trip took me to her friends' rooftop terrace in Williamsburg where I played beer pong basked in the glowing light of the Manhattan Bridge. Needless to say I have been besotted with the city ever since. 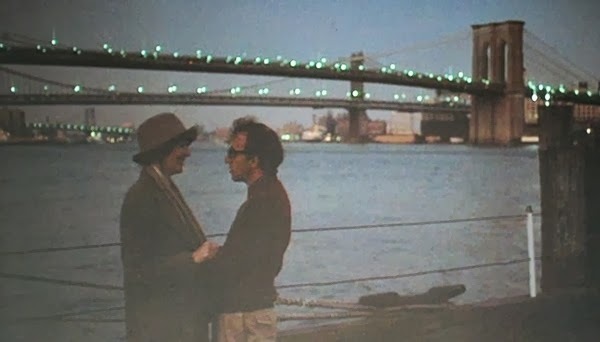 It's not just the exteriors that caught my eye in Annie Hall, either. The minimalist interiors made me wish I could bring a little bit of East Coast cool to my student house bedroom. What I would do for an apartment with beautiful, vast bookshelves. Sure, my box-sized abode is good for cosiness but not for housing numbers of paperbacks. Although I can't say my housemates would appreciate me putting my bed into the living room like the set up of this snapshot. As the film rolled on we tucked even more ferociously into the Dominos pizzas. This was my fifth pizza encounter of the week, after having a Pizza Hut guy turn up at our address with two XL pizzas which none of us had ordered. We felt bad for consuming what was essentially stolen property, but then we had no idea who it was actually for, and we're students. When pizza falls into your lap, you lap it up. Although we weren't so smug when our neighbours knocked on our door at 4am laughing, then running away, leaving only a Pizza Hut pizza box (assumingly their replacement) with a skull and our house number drawn on in dark, thick marker. After the film ended, my housemates and I walked back briskly to burn off a tiny chunk of the cheese we had consumed (the cheddar topping alongside Woody Allen's puns) and to fight the gnaw of the cold. All in all, a perfect winter's evening.